You find out who did it on the very first page. On the last page, you'll find out why in this expertly plotted, “enthralling” (J. P. Delaney) psychological suspense novel from an internationally bestselling author. This gripping psychological thriller will have you questioning, who—of Harry, Julie and JP—is really the guilty one? And is Carney's surrender driven by a guilty conscience or is his confession a calculated move in a deadly game? Brilliant and ice-pick sharp, The Confession is perfect for fans of B. A. Paris and Fiona Barton. One night changes all their lives. 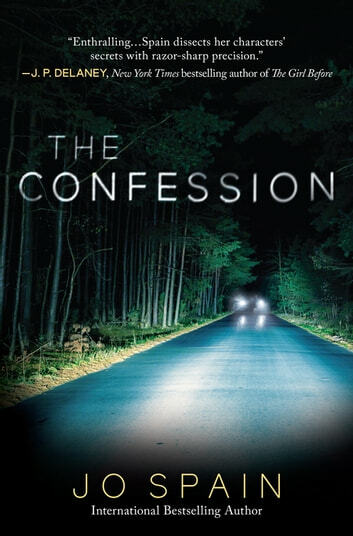 4 Stars Review by Morgen Late Night Reviewer Up All Night w/ Books Blog The Confession by Jo Spain is a standalone novel about how damaging secrets can be. Julie and Harry McNamara are a happily married couple of over ten years. Julie was once a school teacher and is now a stay at home wife. Harry is a banker and one of the wealthiest men in Ireland. One of the things his money can’t do is solve all of their problems. Julie is witty, strong, and caring. Harry is charming, confident, and business minded. JP Carny is a man with a troubled past and a not so bright future. He has no family to speak of and moves from job to job. Most aspects of his life are a mystery. One night will change all their lives. A man creeps in through their back door he finds Harry and Julie enjoying some evening television. He surprises them and continues to beat Harry to a bloody pulp in front of Julie. Shocked into silence and unable to move Julie watches in horror. Over as quickly as it begins the man who invaded their home is gone. Thinking her husband is dead she crumbles. It takes her a while to pull it together enough to call the police. Harry is rushed to the hospital, he’s not dead but in coma from trauma. By the end of the night a man covered in blood turns himself in to the local police station and confesses to the murder of Harry McNamara. He claims it was a random act of blind rage and he had no idea who he was attacking. Can it really be that easy or is there more to story than it seems? Julie is such a great character, I really connected with her strength. I enjoyed how the story was told. It’s not chronological but it unravels smoothly flashing from the past to the present and flows well with the story. We get to see a few different POVs which adds depth to the characters, making them feel and worth fighting for. I love getting a full sense of the scenes and having a peek at their motivations. The suspense draws you in and learning piece by piece keeps you on the edge of your seat and wanting more. The story is set in Ireland. I really enjoyed the brogue and learning a bit about the country. I would recommend to anyone who likes a little mystery.